The Perioperative Quality Improvement Programme has developed a mobile app which can be downloaded free from the iOS or Android app stores.Click here to be directed to the appor use the QR code below. 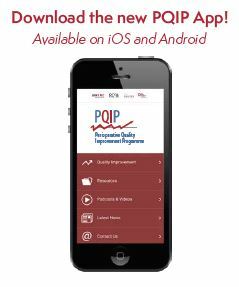 The PQIP App provides easy access to quality improvement resources which will be useful to anyone with an interest in QI and an opt-in for push notifications to keep you updated with the latest PQIP information. As with the NELA App (also available now),the PQIP App doesnotallow the entry of any patient identifiable data, however users can link to the PQIP webtool via the app and enter data after securely logging in. Please do send us your feedback on the app and how it could be improved by emailing the PQIP inbox.